Skip questions if you don't know the answer - you can skip to the bottom and hit the submit button once you have completed the red questions! FILE TYPES ACCEPTED: .jpg, .gif, .doc, .pdf, .xls, .txt, .zip, .dwg. If you wish to send other file types, contact customer service for instructions. Large files will cause your form to submit slowly, so be patient if you are sending files larger than 1MB. For multiple file uploads, utilize ZIP to compress into a single file, or contact us. Describe what your situation - are you filling a warehouse, or adding a row? You can leave other notes in this field. Please select one of the types. For information on these rack styles, click the link for popup information. To select, click the option button. Provide as much detail as you can. We can fill in the blanks later. Estimate by the largest load. 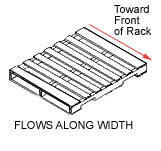 For the height dimension, include the height of your pallet. Enter the following information on the space your rack will occupy. Enter all measures in inches unless otherwise requested. What product are you storing on this rack? Which rack options are you interested in? Check all that apply. 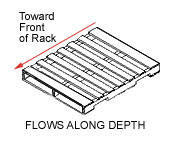 Links will open a new window for that particular pallet rack option.